Our next Production is a Variety Concert, 'Rewind To The 80's'. 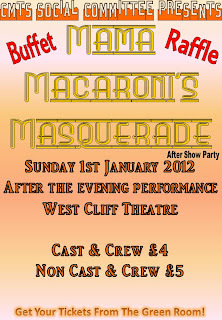 It will be on Sunday 26th February 2012, at the West Cliff Theatre. Rehearsals start on Thursday 6th January 2012, at our HQ. Please come along to see what it is all about. As we have two Choreographers, the Management Committee has decided there will be no Dance Captain. 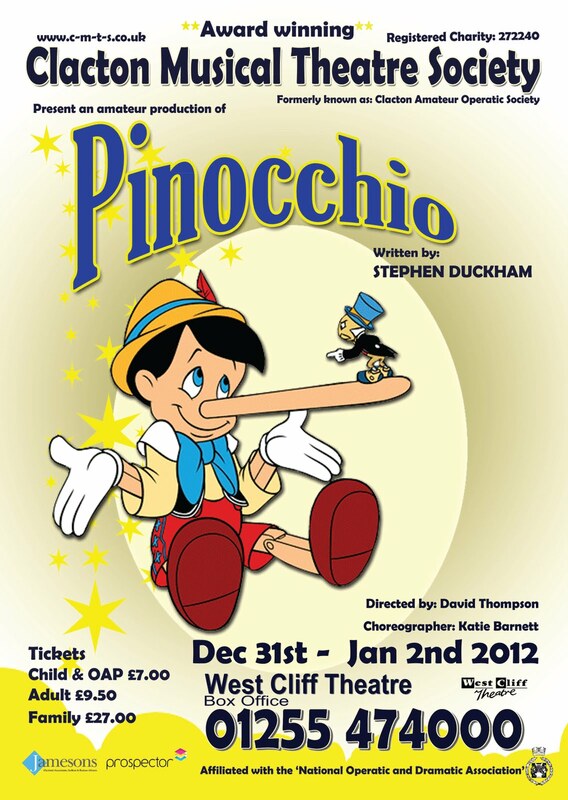 Just a reminder that 'Pinocchio' starts this Saturday; have you got your tickets yet? The Management Committee would like to wish everyone a Happy New Year and best wishes for 2012. The Youth Performers Casting Committee would like to congratulate everyone who auditioned on Friday and Sunday for 'Bugsy Malone'. Dandy Dan's Gang - Sam Kemp, Isobel Dullage, Ellie Watling, Jack Flynn, Matthew Homes-Gifford. Fat Sam's Gang - Maddie Corbett, Eddie Homes-Gifford, Amelia Dullage, James Peters, Adam Heyhoe, Emily Adams, Charlotte Tibbles. Junior Dancers - Ellene Seaman, Georgia Ayton, Athina Nicholou. Senior Dancers - Charlotte Levine, India Frank, Lucy Long & Gabrielle Tyler. Just to remind everyone that the whole Cast is required at every Rehearsal from now on from 1930, for a prompt start, and to 2200. Please ensure you can attend. Thank You. If you are free for 15 minutes on Friday the 2nd December, we are doing some carol singing at Holland Haven Primary School. The school is on Primrose Road, in Holland. You need to be there for 4pm please, singing starts at 4.15 and we will finish by half past. Please wear white shirt or blouse with black trousers or skirt, with a shawl for the ladies and an old jacket, gloves or hat for the gents. We are looking for a Victorian look please! There will be lanterns to hold. If you are able to join us, please can you call Sam McCarthy. Thank You. Also to those who are helping with the Pinocchio Publicity, please ensure you are at the school by 4pm at the latest. Thank You. Any questions or queries, please contact Sam on 01255 427256 or 07788 414757.